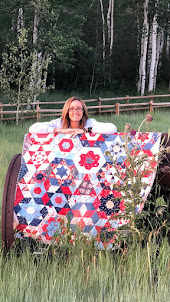 Lizzie the quilter: Sewing fun. I have had such a fun time in my sewing room this week. I finished a few projects and of course started a few new ones. I sorted my Bonnie and Camille scraps and made a table runner. I love how it turned out. I also made a cushion, this was one of my very first designs and it was fun making it up again. Yesterday I taught a patch work class at Patchworks plus in George Town, we had a great day, the ladies are lovely and they picked up quilting in no time. We made disappearing 9 Patch quilts. Sarah also has a new web site, its beautiful. You should take a look when you get a chance. This is Kaylene, one of my students, she is a real character. I'm looking foreward to teaching them again in the future. 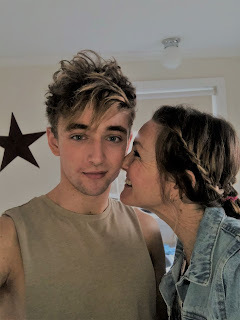 Our number 2 son Jacob turned 16 on Thursday, when did he get so tall. My boys are growing up so fast. Now its time to take our eledest son on his driving lesson, wish me luck. Have a great day and I hope you get some sewing done. Lovely table runner and cushion Leanne. Those Bonnie and Camille fabrics are so gorgeous. Happy birthday to Jacob. Enjoy the driving lesson! Oh they are such beautiful makes Leanne... gorgeous way to use some of your B&C bits & bobs... I love the runner! Good luck with the driving lesson - I only have one doing them now, rather than both of my girls, what a relief! Happy Birthday to Jacob. Love your B&C projects. Lovely projects Leanne! 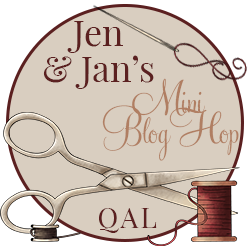 Bet you thought you'd never be a quilting teacher, go girl! Lachlan's on his L2s now and today we drove to Richmond and back....i still get nervous! Bonnie & Camille fabrics never fail no matter what project they are used for. Very pretty indeed. My word your son has grown - a young man now. More lovely goodies Leanne. Birthdays always remind us that our babies are so grown up and we wonder where the time has gone. I love both of your projects! I think it's kind of neat when a son gets bigger than you are. We are staying at our son's home and helping give our GS some driving practice. He is so sweet and apologizes if he puts on the brakes too fast. Just checking my word verification is working, there is so much spam on here its driving me crazy.